Fast Affordable Mobile Notary Public Sarasota | Loan Signing Agents Serving Sarasota | Siesta Key | Gulf Gate | Sarasota Springs | Lakewood Ranches | Lido Key | Kensington Park | Lakewood Ranch | Downtown Sarasota | Longboat Key | Baysg Bayshore Gardens | and all surrounding area's. Welcome to Fast Affordable Mobile Notary Inc. We will notorize your documents, meet your clients, visit hospitals, medical centers, homes, jail, or public area. We offer great customer service. We can (for an additional fee) print your documents, bring a witness, mail/scan docs after signing. Mobile Notary/Loan Signing Services are available 7 days a week to assist you with all of your notary needs. Notary and Mobile Notary Public Service serving Sarasota Florida, Gulf Gate, Siesta Key, Lakewood Ranch, Sarasota Springs, Lido Key, Longboat Key, Downtown Sarasota and all surrounding areas. Services include: Sarasota Florida - Wills; Trusts; Medical Documents; Loan Signing Agent for Real Estate Documents; House closing; Title work; School and Employment papers, car titles and jail house signings. Most mobile notaries on average charge $75 to $175 for traveling fee and notary signatures for Maricopa County for standard notary which may include Wills, Trusts, Power of Attorney, Misc Medical Forms. Most mobile notaries and Loan Signing Agents for Escow and Title agencies on average charge $150 for traveling fee and Loan Signing Documents. Additional fees may apply for printing documents (avg. $35) with free drop off if in same area. Fed Ex is available for shipping costs only. Most mobile notaries and loan signing agents for real estate loan closings on average charge $150 for a wedding ceremony. If you just need the wedding certificate notorized charge is generally $95 traveling fee including notary signatures. If you need a witness, the charge is generally an additional $75. Each separate notary and loan signing agent sets there own price for traveling fee and notary signature which may be more or less. Sarasota Florida Mobile Notary Service by Fast Affordable Mobile Notary, Inc. Mobile Notary Public serving Sarasota, Gulf Gate, Siesta Key, Lido Key, St Armands, Kensington Park, Lakewood Ranch and surrounding area's in the Gulf Coast area. Wills, Real Estate Documents, Title Companies, Weddings. Same Day. Our goal is to give you prompt, courteous and confidential service in the Sarasota Florida Area. We cater to the needs of the financial, legal and real estate industry. Our mobile notary public signing agents come to you, at your convenience. This offers you no missed time from work, and the convenience of a discreet mobile notary service. Our licensed Mobile Notaries will travel to your location anywhere to assist you. Serving the area's of Sarasota County. Mobile Notary Public Services for Real Estate Closings, Wills, Child Custody, Licenses and More.....At some in everyone's life, you will need a notary. Why bother taking off work to drive to a notary’s office when mobile notary public services come to you? If you are closing on a mortgage home loan, we can work with the title company to bring the paperwork to sign at your home, office, or other location including all parties. That means you close on your home faster, and with convenience. Our mobile notary publics also can assist with all trusts, wills, child custody agreements, and other important documents you may need to have a mobile notary public service for. Welcome to Sarasota Florida - Fast Affordable Mobile Notary Inc. An affordable, easy local traveling mobile notary public services . meeting place at a time that fits your busy schedule! service, and member of the national notary association and Arizona Association of Mobile Notary Public Services. institutional, title companies, offices, conference rooms, senior centers, convalescent homes, retirement homes, your place of business, office or your residence. 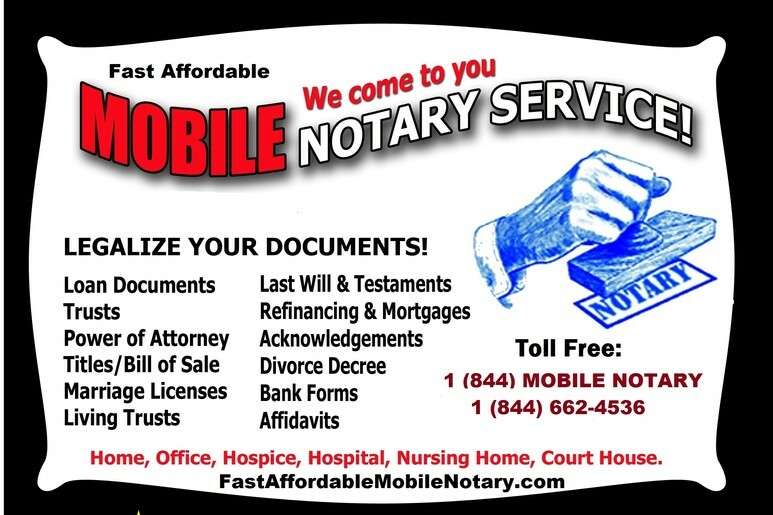 Fast Affordable Mobile Notary, Inc.
UPS or express mail or US Postal Services . travel out of the country, and just about anything that needs notarization. Mobile Notary Public serving Sarasota, Gulf Gate, Siesta Key, Lido Key, St Armands, Kensington Park, Lakewood Ranch, Bradenton, Anna Maria Island, St Petersburg, St Pete's Beach, Treasure Island, Gulfport, Tampa, Tampa Bay, Clearwater Beach Florida and surrounding area's in the Gulf Coast area. Wills, Real Estate Documents, Title Companies, Weddings. Same Day.